You may receive a shipping update for your Amazon package delivery with a Now expected by date. Amazon will confirm the package is late. 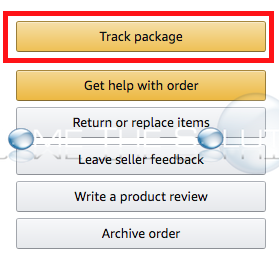 You can view your Amazon package delivery statuses by going to Orders in your Amazon account. Below is an example for a now expected delivery date message. We don’t have a new delivery date, but we recommend waiting as it’ll usually arrive within a few days. Please come back “” if you still don’t have it and we’ll help you out. Check out: current Amazon delivery statuses. 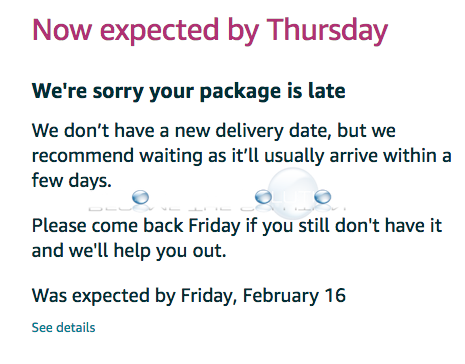 This message is known to occur when your Amazon package was planned to arrive on a holiday or over a holiday weekend. In addition, the now expected delivery date includes days for handling time, weekends, and holidays (not just business days). The delivery message will display the latest delivery date available and encourage you to wait the allotted time. If your package was shipped with a domestic carrier, check for the Tracking Information button next to your order. If your package is still not delivered within the estimated time indicated in your order statuses, contact Amazon customer service.